Do you ever dream about holiday decorations and spend hours imagining how you would do things if you had an unlimited budget? Well I can tell you that we do! 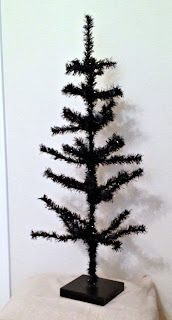 I've been dreaming of a Halloween tree for years, but just couldn't bring myself to spend the money on a black tree. 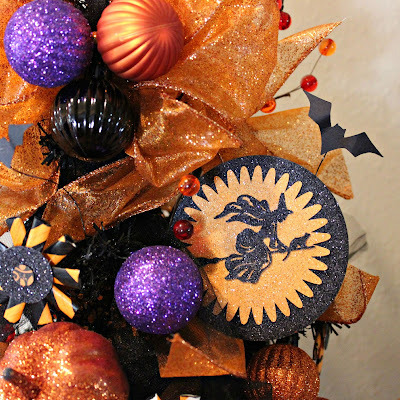 But thanks to Hobby Lobby's after Christmas clearance in January of this year, we now have our very own Halloween Tree! It's the perfect spot for our Vintage Halloween Cat and for $2 I couldn't pass it up. You've probably seen these trees at Hobby Lobby and I've always thought they looked so sad. Especially the black ones! 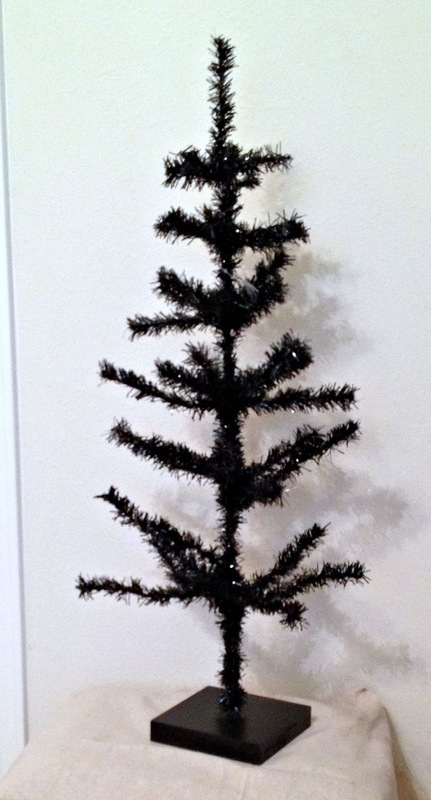 I'm sorry, but I just think there is something wrong with black Christmas trees. Black is for Halloween! Not Christmas! Worse than Charlie Brown's tree - don't you think? But it made a great base for our vintage tree. I filled it in with lengths of black tulle, also from Hobby Lobby, and that made all the difference in the world. The tulle was cut in lengths equal to the branches, and tied onto the trunk. Then we added ribbon, ornaments made with glitter paper, starbursts made from paper straws and small ornaments from Garden Ridge. You might know it as At Home but it will always be Garden Ridge to me! The Boo ornament came from Michaels. It was plain wood and got a coat of orange paint and glitter, of course! Quite a difference don't you think? We are lucky enough to have a Cricut, and cut out the bats, witch, ravens and cat out with it. They have a great vintage feel, especially with the glitter paper. The orange sparkly ribbon also came from Hobby Lobby and took an entire spool. The pumpkins were perfect after I hit them with a coat of spray glue and orange glitter. I had a small flower pot out in the garage that we spray painted orange to use as a base. We filled it with plaster of Paris, then removed the wood base from the tree and set it into the pot. Leigh and I debated about decorating it, but ultimately felt that it detracted from the tree and looked better plain. I know it's kind of early for Halloween, but I've been dreaming about this tree since January and just couldn't wait any longer! Besides, I'm going to start decorating for Halloween next weekend. What better way to spend a 3 day weekend than turning the house into Halloween Town? What do you think? Too early or not? Please let me know if I'm crazy or just getting ahead of the holiday rush? Lovely, you did a great job. Thank you so much! 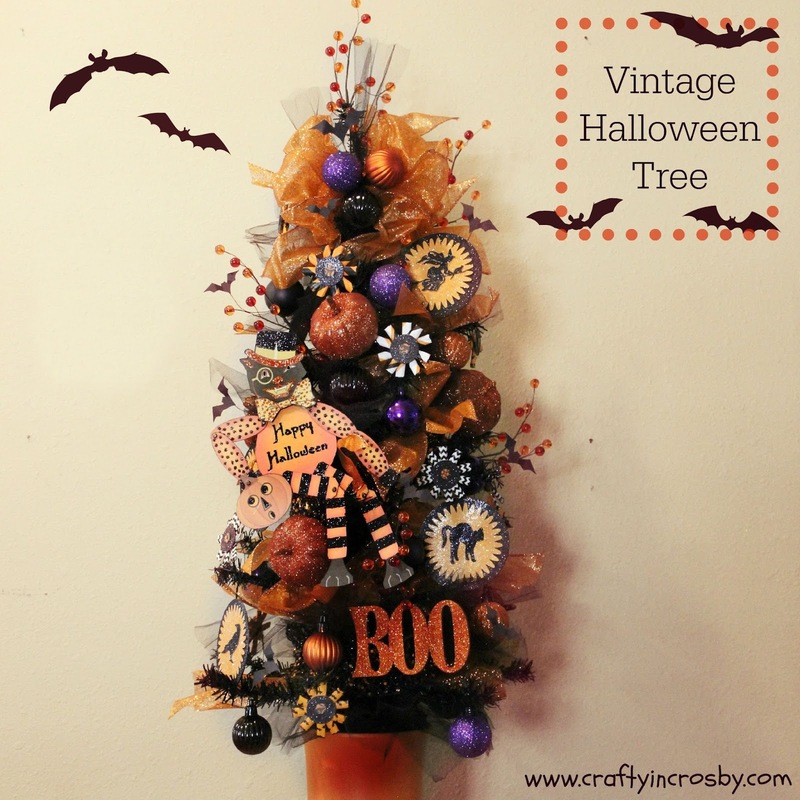 We just love Halloween and are designing a whole vintage theme area now to go along with our tree. Thanks for stopping by! I love your Halloween tree, it's perfect and cute. You are so kind Julie! Thanks for dropping by and come back soon! This is adorable! I love it. Using the tulle was a great idea to add lots of fullness. It's not too early if it makes you happy! That's my motto about holiday decorating. Thanks for partying at Snickerdoodle Sunday. Thank heavens someone else doesn't think we're loony out here! Thanks for having us over to the fantastic party! 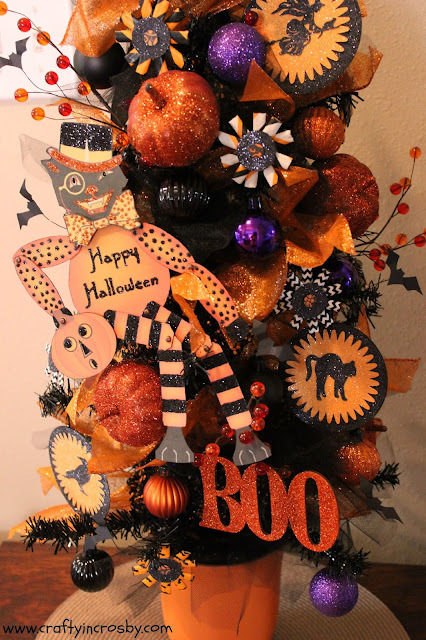 I love your Halloween tree! My favorite part about it is how packed it is with goodies! I pinned it to my Holiday Trees pinterest board! Aww, thanks so much Tania! Pins make us smile! Thanks for stopping by and come back soon! A Pin is the highest honor! Thanks so much for stopping by Ashley. Hope you have a fantastic week! Super cute tree! 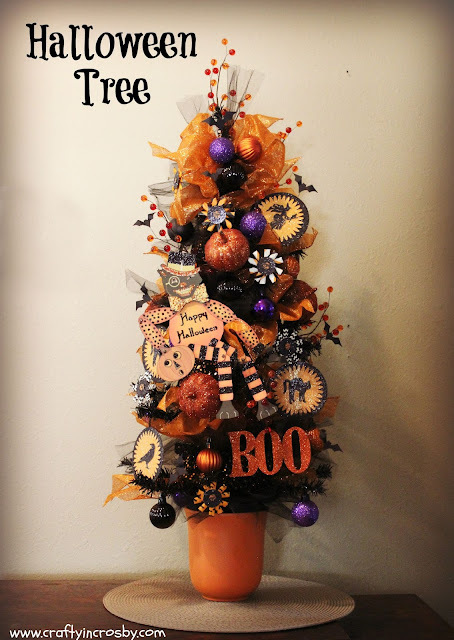 I've never had a Halloween tree, but now I want one! I think my daughter would love it. I really like the cat in the tree! I'd love for you to stop by the Submarine Sunday Link Party to share this crafty creation! I hope to see you there! Thanks Tonna! I just linked up to your fabulous party! Thanks for the invite! Have a great week! 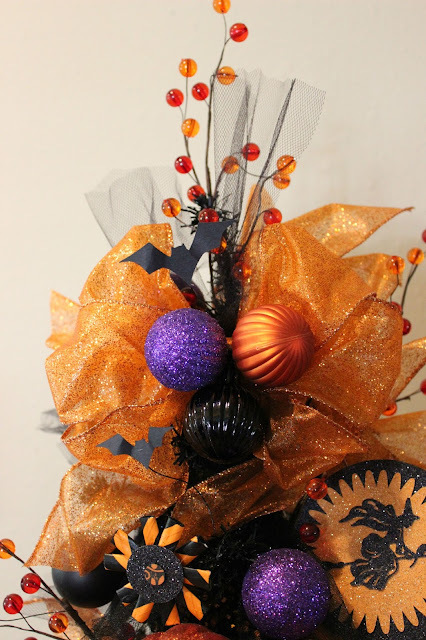 Super cute, i never have the foresight to think of halloween in january! For me, black trees are only Halloween. I've seen them decorated for Christmas, but they just don't seem right, so for me it was definitely a tree for Halloween! Wait, who am I kidding? I'm always thinking about Halloween! LOL!! Thanks for stopping by! Love the Tree!! Very pretty!! You are so kind! Thanks Deb! Super cute!! Love the vintage cat! Me too Jenna! Just love him and the touch of glitter (although hard to see in the photos) was the finishing touch. Have a wonderful week! This is such a cute tree! I love the creativeness behind it! Thanks for having us over for the party! I can only imagine how much work goes in to a weekly party and we really appreciate it! Great job! The finished product is anything but sad looking! Thank you for sharing at Merry Monday! That's what we were going for - a Happy Halloween Tree! Thanks so much for having us over! Have a wonderful week! Love your tree. I'll feature on my Halloween week party! The Fall party is open. Come by and link your Fall posts! This is so adorable! I'm a designer for Bowdabra.com. Would love for you to link up this and any of your lovely projects on https://www.bowdabrablog.com/2015/08/29/saturday-crafty-showcase-linky-party/ Do stop over for a visit! Awesome job! That is too cute. Thanks Carla! I really love how it turned out! Wow, this is so lovely!! Thanks so much Liz! Glad you stopped by!